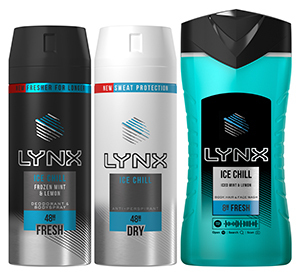 Lynx, the UK’s number one male deodorant and shower brand,1 has introduced its new variant for 2019 – Ice Chill. Designed to help men who lead busy and stressful lives to find their ‘chill’ so they can be the best version of themselves, the new variant features a fresh new Frozen Mint & Lemon fragrance, as well as an improved anti-bacterial formulation to help fight body odour for up to 48 hours. Ice Chill is launching across Lynx’s whole portfolio, including body spray, anti-perspirant, shower gel and shower foam, and is designed to target the Gen Z and Millennial consumer groups. The distinctive black and blue packaging provides optimum stand-out on shelf to encourage customer selection. The launch will be supported with a £5m marketing campaign across traditional media with bursts across TV, social and video on demand, along with content production through partnerships with Snapchat and Spotify.